A child eats an apple waiting in line to cross the Serbian-Croatian border, at the village of Berkasovo, near Sid, Serbia, Oct.15, 2015. The European Union states have approved an action plan with Turkey in hopes of easing the flow of migrants to Europe. Even as the leaders debated the plan at a summit in Brussels on Thursday, an Afghan migrant was shot dead in a clash between migrants and border guards at the Bulgarian-Turkish border. The death, believed to be the first of its kind during the crisis, forced Bulgaria's President Boyko Borisov to fly home from the summit. Nearly 600,000 migrants have reached the EU by sea so far this year, many of them traveling from Turkey to Greece before seeking to head north. After the summit, European Council President Donald Tusk told reporters, "First of all, allow me to express cautious optimism, and I have to underline, of course, the word 'cautious.' "
Under the plan, Turkey agreed to tackle human smugglers and take measures to keep more of the millions of refugees from entering Europe. In turn, the EU agreed to accelerate the visa process for Turkish citizens wanting to visit the European Union and open talks on Turkey's membership to the bloc. French President Francois Hollande speaks with the media as he arrives for an EU summit at the EU Council building in Brussels, Oct. 15, 2015. Turkey had also demanded $3.4 billion in new aid, but European Commission President Jean-Claude Juncker said the figure would have to be negotiated. 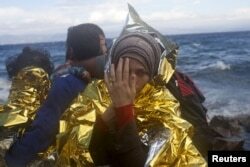 Meanwhile, thousands of people continue to risk the dangerous journey daily. Greece recovered seven more bodies off the island of Lesbos on Thursday after a migrant boat collision, and shivering newcomers streamed into Croatia seeking aid and shelter. The crisis has already led to more than 3,000 drownings this year as people have fled conflict and repression in the Middle East and elsewhere and tried to make the dangerous crossing of the Mediterranean. A Syrian refugee wrapped in a thermal blanket looks on, following her arrival on an overcrowded dinghy on the Greek island of Lesbos after crossing a part of the Aegean Sea from the Turkish coast, Sept. 30, 2015.